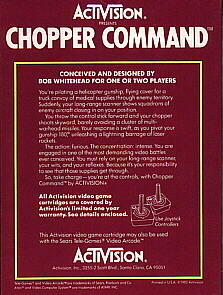 You´re piloting a helicopter gunship, flying cover for a truck convoy of medical supplies through enemy territory. 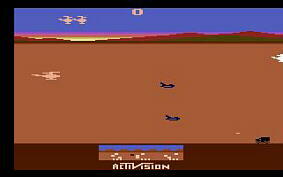 Suddenly, your long-ange scanner shows squadrons of enemy aircraft clsoing in your position. 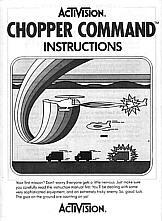 You throw the control stick forward and your chopper shoots skyward, barely avoiding a cluster of multi-warhead missiles. 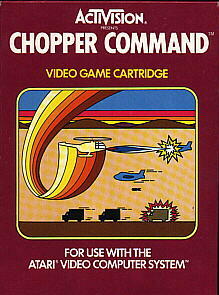 Your response is swift, as you pivot your gunship 180°, unleashing a lightning barrage of laser rockets. The action: furios. The concentration: intense. You are engaged in one of themost demanding video battles ever conceived. You must rely on your long-range scanner, your wits, and your reflexes. Because it´s your reponsibility to see that those supplies get through. 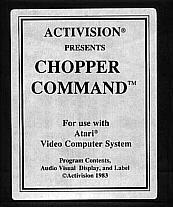 So, take charge - you´re at the controls, with Chopper Command by Activision.